The incidence of diabetes mellitus (DM) and diabetic nephropathy (DN) have risen rapidly in the past few decades and have become an economic burden to the healthcare system in China. DN is a major complication of DM and is a leading cause of end-stage renal disease (ESRD). The occurrence of non-diabetic renal disease (NDRD) in diabetic patients has been increasingly recognized in recent years. It is generally believed that it is difficult to reverse DN, whereas some cases of NDRD are readily treatable and remittable. However, DN is known to co-exist with NDRD in a poorly defined population of patients with type 2 diabetes mellitus (T2DM). This study estimated the prevalence of co-existing DN and NDRD in Chinese patients. Data were retrospectively analyzed from 244 patients with T2DM who had undergone a renal biopsy between January 2003 and December 2011 at the Nephrology Department, China-Japan Friendship Hospital, China. Male patients numbered 151 (61.9%) of the study population. The biopsies were performed because urinary abnormalities or renal function were atypical of a diagnosis of DN. Biopsy samples were examined using light, immunofluorescence (IF) and electron microscopy (EM). Clinical parameters were recorded for each patient at the time of biopsy. Nineteen of 244 diabetic patients (7.8%) had co-existing DN and NDRD. These patients showed clinical features and pathologic characteristics of DN, including a high prevalence of diabetic retinopathy (89.5%), a long duration of diabetes, increased thickness of the glomerular basement membrane (GBM) and mesangial expansion. However, they also presented with clinical findings which were inconsistent with DN, such as hematuria, rapidly progressive renal failure and marked proteinuria. Immunoglobulin A (IgA) nephropathy was apparent in 10 out of the 19 patients (52.6%), tubulointerstitial lesions were found in four patients (21.1%), membrano-proliferative glomerulonephritis (MPGN) in three patients (15.8%) and membranous nephropathy (MN) in two patients (10.5%). Retrospective analysis of biopsy data suggests that approximately 8% of Chinese patients with T2DM may have co-existing DN and NDRD. The most common histological diagnosis in our small series was IgA nephropathy. The incidence of diabetes mellitus (DM) and diabetic nephropathy (DN) have risen rapidly in the past few decades and have become an economic burden to the healthcare system in China. DN, also known as diabetic glomerulosclerosis or diabetic kidney disease, is a major complication of DM and is a leading cause of end-stage renal disease (ESRD). Persistent and slowly progressive proteinuria is a characteristic of DN and diabetic renal failure [1–5]. The diagnosis of DN is usually inferred in cases where renal biopsy has not produced definitive results. These are usually patients with a 7 to 10-year history of type I DM, who have demonstrable diabetic retinopathy and a history of microalbuminuria. These patients present no evidence of a sudden onset of marked proteinuria, hematuria, abnormal kidney size, or other renal disease [5–8]. Renal biopsy in this setting will not be diagnostically useful, while it will be inferred as DN. Most of our knowledge with respect to the nature of kidney disease in patients with type 2 diabetes mellitus (T2DM) is derived from studies of patients with type I DM . However, biopsy data from patients with T2DM with renal disease or proteinuria show that these patients have a more heterogeneous group of renal lesions than patients with type I DM [3–5, 7–9]. Based on these findings the occurrence of non-diabetic renal disease (NDRD) in diabetic patients has been increasingly recognized in recent years. However, the prevalence of NDRD varies widely in different regions of the world and is reported to range from 15.7% to 82.9% [10–27]. It is generally believed that it is difficult to reverse DN, whereas some cases of NDRD are readily treatable and remittable. However, in some diabetic patients, DN and NDRD co-exist. Based on data published between 1983 and 2012 (Table 1), the prevalence of DN complicating NDRD ranges between 3.0% and 45.8% [6, 10, 12, 13, 15–17, 19, 21, 22],[28–30]. DN, diabetic nephropathy; IgA, immunoglobulin A; NDRD, non-diabetic renal disease. The present retrospective, single center, analysis was undertaken to estimate the prevalence of DN complicating NDRD in Chinese patients with T2DM. The pathogenic mechanism of DN that complicates NDRD is thought to be different to the mechanisms that underlie either DN or NDRD alone [10, 18, 21, 22, 27]. We, therefore, also studied the correlations between the clinical and pathologic features in these patients. The study included data from 244 patients with T2DM who underwent renal biopsy between January 2003 and December 2011 at the Nephrology Department, China-Japan Friendship Hospital, China. Male patients numbered 151 (59.4%) of the study population. Patients with known DN were excluded from the study as renal biopsy was not routinely performed in these patients at this institution. Patients with current acute illness including infectious disease were also excluded from entry. The existence of immunologic diseases, malignancy and infections was also investigated prior to inclusion into the study. The study protocol was approved by the Human Ethics Review Committee of the China-Japan Friendship Hospital and a signed consent form was obtained from each patient before biopsy. DM was diagnosed using the criteria of the American Diabetes Association . The clinical and demographic parameters were recorded for each patient at the time of renal biopsy. These included duration of diabetes, blood pressure, electrocardiogram, echocardiogram, kidney ultrasound and funduscopic findings. Laboratory studies included fasting blood sugar, glucose tolerance test, glycated hemoglobin (HbA1c), urinalysis, urine osmotic pressure, 24-hour protein excretion, total protein, albumin, blood urea nitrogen, serum creatinine levels and creatinine clearance. Nephrotic syndrome was defined as proteinuria (>3.5 g/day) accompanied by edema, hyperlipidemia, hypoproteinemia, or other metabolic disorders . Nephritic syndrome was defined as pathologically diffuse inflammatory changes in the glomeruli accompanied by hematuria with red blood cell casts, mild proteinuria, and, often, hypertension, edema and azotemia. Renal failure was diagnosed in patients with blood urea nitrogen >20 mg/dl and serum creatinine >1.4 mg/dl. Hypertension was defined as a systolic blood pressure >140 mmHg or diastolic blood pressure >90 mmHg. In all cases renal biopsy was performed because urinary abnormalities or renal function was inconsistent with the clinical expression or the natural history of DN. Percutaneous renal biopsy were performed as described by Veiga . Renal tissue submitted for diagnosis was divided into three portions. One portion was fixed in buffered formalin and processed onto paraffin blocks for light microscopy examination. Sections were stained with hematoxyline and eosin, periodic acid-Schiff (PAS), silver methanamine and Masson’s trichrome. The second portion of tissue was frozen for direct immunofluorescence (IF) studies using fluorescein isothiocyanate (FITC) conjugated antibodies for immunoglobulin A (IgA), immunoglobulin G (IgG), immunoglobulin M (IgM), C3, C1q and fibrinogen (FIB). The third tissue portion was fixed in Trump’s electron microscopy (EM) fixative and processed into resin blocks. Ultrathin sections were stained with uranyl acetate and lead citrate, and examined using a transmission electron microscope. Renal lesions were classified according to the Chinese classification criteria for renal diseases . Each biopsy was reviewed by two pathologists, both dedicated to renal pathology. Statistical analysis was performed using SPSS version 17.0 for Windows (IBM SPSS Statistics, Armonk, NY, USA). Data were expressed as mean ±SD. The Spearman rank correlation test was used to determine the associations between clinical parameters and histopathological findings. Values of P <0.05 were considered statistically significant. Data were retrospectively analyzed from 244 patients with T2DM. Male patients numbered 151 (61.9%) of the study population. There were 20 cases (8.2%) with a pathologic diagnosis of DN, 205 cases (84%) with NDRD and 19 cases (7.8%) had DN complicating NDRD. The proportion of males was 65% in DN, 59% in DNRD and 89.5% in DN complicating NDRD, respectively. The clinical features and laboratory data are summarized in Table 2. The population included 17 men and two women between 28 and 64 years of age, with only one patient older than 60 years. All patients had T2DM; the duration of diabetes at the time of renal biopsy ranged from 2 to 20 years. Diabetic retinopathy was present in 17 patients and the majority of patients had hematuria (15 cases, 78.9%). Fourteen patients had hypertension, four patients had nephrotic syndrome, six patients had nephritic syndrome and nine patients had renal dysfunction. ARF, Acute renal failure; BUN, Blood urea nitrogen; CRF, chronic renal failure; DN, diabetic nephropathy; HbA1c, glycated hemoglobin; NA, not available; NDRD, non-diabetic renal disease; NG, nephritic syndrome; NS, nephrotic syndrome; T2DM, type 2 diabetes mellitus. Patients with a longer history of diabetes had higher urinary protein levels than those with a shorter duration of diabetes (r = 0.67, P <0.05). However, there was a poor correlation between disease duration and fasting blood sugar (r = 0.116, P >0.05) and HbA1c (r = 0.256, P >0.05). Renal pathology findings are summarized in Table 3. All patients had diabetic renal lesions complicated with NDRD. The most common NDRD finding was IgA nephropathy (Figure 1), which was present in 10 patients (52.6%). Four patients had tubulointerstitial lesions (Figure 2), three patients had membrano-proliferative glomerulonephritis (MPGN) (Figure 3) and two patients had membranous nephropathy (MN) (Figure 4). A case with immunoglobulin A (IgA) nephropathy and diabetic nephropathy (DN). (A) Typical mesangial absorbance pattern after labeling with anti-IgA antibody (IF, 200×). (B) The deposits of mainly IgG collected in the basement membrane and appeared in the linear pattern as shown by immunofluorescence (IF, 200×). (C) Mesangial cellularity and matrix increased, and there was a thickening of the glomerular basement membrane (GBM) (PAS, 200×). (D) The electron micrograph demonstrated an increase in small dense deposits in the mesangium and the mesangial matrix. The basement membrane was diffusely thickened due to diabetic involvement (EM, 5000×). DN, diabetic nephropathy; EM, electron microscopy; GBM, glomerular basement membrane; IF, immunofluorescence; IgA, immunoglobulin A; IgG, immunoglobulin G; PAS, periodic acid-Schiff. A case with chronic tubular interstitial nephritis (TIN) and diabetic nephropathy (DN). (A) Deposits of mainly IgG collected in the basement membrane and appeared in a linear pattern as viewed by immunofluorescence (IF, 200×). (B) (PAS, 100×) and (C) (Masson, 100×) show severe mesangial expansion (Kimmelstiel-Wilson nodules) and severe tubular injury with only minimal cell infiltration in the interstitial area. DN, diabetic nephropathy; IF, immunofluorescence; IgG, immunoglobulin G; PAS, periodic acid-Schiff; TIN, tubular interstitial nephritis. A case with membrano-proliferative glomerulonephritis (MPGN) and diabetic nephropathy (DN). (A) This silver staining demonstrated a double contour of many basement membranes, with 'tram-tracking', which is characteristic of type I MPGN (PAS, 200×). (B) Prominent subendothelial deposits and mesangial interposition are seen (EM, 5000×) and (C) the basement membrane was thickened due to diabetic involvement (EM, 5000×). DN, diabetic nephropathy; EM, electron microscopy; MPGN, membrano-proliferative glomerulonephritis; PAS, periodic acid-Schiff. A case with membranous nephropathy (MN) and diabetic nephropathy (DN). (A) Deposits of mainly IgG collected in the basement membrane and appeared as a diffuse granular pattern as shown by immunofluorescence (IF, 200×). (B) Light microscopy showing membranous glomerulonephritis in which the capillary loops were thickened and prominent. Numerous granular dense deposits were located in subepithelial areas (PAS, 200×). (C) Thickened glomerular basement membrane (GBM) with numerous granular, dense deposits located in subepithelial areas (EM, 5000×). DN, diabetic nephropathy; GBM, glomerular basement membrane; IF, immunofluorescence; IgG, immunoglobulin G; MN, membranous nephropathy; PAS, periodic acid-Schiff. The fluorescent staining was graded as follows: - negative, ± doubtful, + weak, 2+ moderate, 3+ bright. DN, diabetic nephropathy; FIB, fibrinogen; IgA, immunoglobulin A; IgG, immunoglobulin G; IgM, immunoglobulin M; NDRD, non-diabetic renal disease. The occurrence of NDRD in diabetic patients is well recognized. A variety of renal lesions can occur in diabetic patients, such as IgA nephropathy, MN, mesangial proliferative glomerulonephritis, hypertensive renal disease and focal segmental glomerular sclerosis. In some diabetic patients, DN is complicated by co-existing NDRD. We summarize the relevant studies published between 1983 to 2012 [6, 10, 12, 13, 15–17, 19, 21, 22],[28–30], which indicated that glomerular disease (58.2%) remains the most common renal complication in diabetic patients with co-existing DN and NDRD. The review showed that the three most common forms of glomerular disease were IgA nephropathy (14.1%), mesangial proliferative glomerulonephritis (10%) and post-infectious glomerulonephritis (10%). Tubulointerstitial lesions (25.5%) and vascular lesions (10%) also existed in such patients. In the present study, we found a high incidence of DN complicating NDRD (7.8%). These patients all had pathologic hallmarks of DN, including increased thickness of the glomerular basement membrane (GBM) and mesangial expansion. According to the new classes of glomerular lesions in DN, the degree from light to severe are presented as follows: I. Mild or nonspecific light microscopy changes and electron microscopy-proven glomerular basement membrane thickening. IIa. Mild mesangial expansion. IIb. Severe mesangial expansion. III. Nodular sclerosis (Kimmelstiel-Wilson lesion). IV. Advanced diabetic glomerulosclerosis [35, 36]. In our study, most patients’ glomerular lesions in DN were IIb or III. The most common NDRD in our patients was IgA nephropathy, which accounted for 52.6% of all cases, followed by tubulointerstitial lesion (21.1%) and MPGN (15.8%). The high prevalence of IgA nephropathy was in accordance with findings from the aforementioned literature review, which showed prevalence rates ranging from 7.1% to 44.8% [10, 15, 16, 21, 28, 30]. The disease spectrum of DN complicating NDRD in China might be thought to be different from that in other parts of the world. Our findings are in accordance with those of other studies, which have reported IgA nephropathy to be the most common NDRD pathology in Asian diabetic patients [7, 15, 37]. There was a high prevalence (89%) of diabetic retinopathy among our 19 cases of co-existing DN and NDRD. The mean duration of diabetes was more than 7 years, and there was a direct association between duration of diabetes and the severity of proteinuria. The poor correlation between disease duration, fasting blood sugar and HbA1c does not necessarily indicate that DN is the only factor affecting disease progression, since the poor correlation coefficients may have been the consequence of the diversity of other types of NDRD. It is possible, however, that is in the small population. The other surprising finding of this study was the high frequency of hypertension (14 cases, 73.7%), especially as some workers report absence of hypertension in DM as one of the differential diagnostic features of NDRD . These findings indicate that blood pressure control is of primary importance in the prevention of progressive renal disease. Our results indicate that there are distinct clinical and pathologic features in diabetic patients with DN complicating NDRD. These patients have some of the clinical and pathologic features of DN, which include a high prevalence of diabetic retinopathy, a long duration of diabetes, increased thickness of the GBM and mesangial expansion. Other clinical findings are inconsistent with the natural history of DN, including the presence of hematuria, rapidly progressive renal failure and severe proteinuria. These diverse clinical manifestations might be the direct consequence of a different pathologic diagnosis within the population. 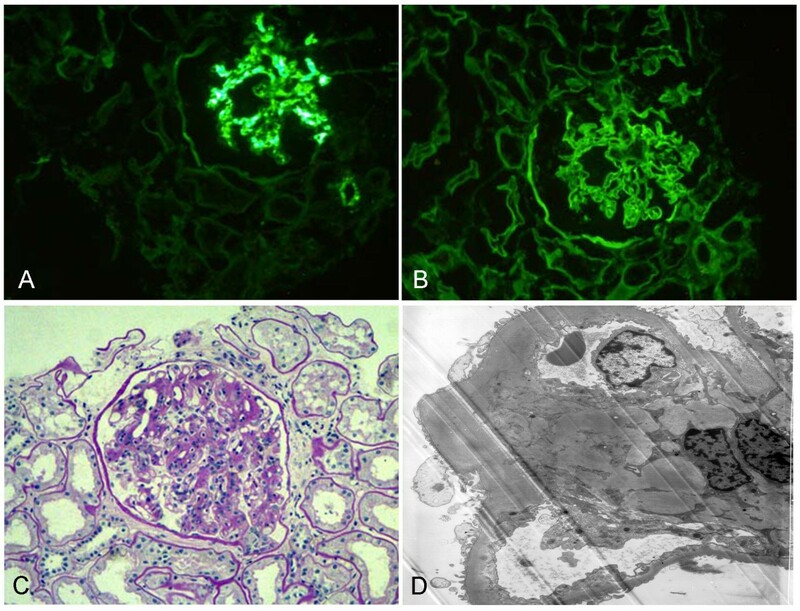 IgA nephropathy was the most common histological diagnosis in patients undergoing renal biopsy. However, the pathologic types of NDRD in DN complicating NDRD in diabetic patients are no different to those in non-diabetic patients in previous studies . In this study, retrospective analysis of biopsy data suggests that approximately 8% of Chinese patients with T2DM may have co-existing DN and NDRD. The most common histological diagnosis in our small series was IgA nephropathy. However, it is single-center study with a small number of patients. Larger, multicenter randomized prospective studies are, therefore, required to confirm these preliminary findings. This work was supported by the National Natural Science Foundation of China (81170675, 81200537) and the Science Foundation of China-Japan Friendship Hospital (2010-ZD-05). LZ conceived the study and drafted the manuscript. WL participated in the study design and coordination, and helped draft the manuscript. GZ carried out the renal pathology. JL carried out the immunoassays. WR performed the statistical analysis. All authors read and approved the final manuscript.